In this article, you will discover the steps a novel must go through in order to be made into a film; you’ll gain a deeper understanding of the process and discover the elements that you, as an author, can control to have a positive impact on the chances of seeing your book on the big screen. This article will focus on the period of time before filming begins since this is when an author has the most impact on the project. Once the cameras start rolling, the author’s role lessens greatly. The process of turning a novel into a film is a long and complex journey filled with dangers, disappointments, and frustrations. Even if an author is able to attract interest in turning his or her book into a film, the chances of it actually happening are still pretty slim. This said the process is not all doom and gloom. Recent changes in the way films are being funded is creating more demand for suitable novels, and authors are not helpless in making their stories more attractive to filmmakers. Although authors often play only a small role in the filmmaking process, they can do certain things to make their book more appealing to filmmakers. If a filmmaker decides to make a film version of your book, the filmmaker’s first step is to secure what is known as an “option”. This is a legal agreement between the author and the filmmaker, which gives the filmmaker the right to make a film adaption of the novel. This is not a contract to make the film. The full contract comes later. The option gives the filmmaker a set period of time (normally a year) to meet certain criteria to show progress toward the film’s creation. These key milestones tend to be things such as funding and screenwriting. The filmmaker may pay the author for the option, though this is not always the case. Demand for the option (Is there more than one person interested?). The author (J. K. Rowling will be able to demand more for an option than an unknown author). The book (a best seller will be more valuable than an unknown book). The filmmaker (Steven Spielberg or Ron Howard may be in a position to pay more than a first-time director). The option will run for a determined period of time. This is often a year, but, as with all things, can vary. You also often find that options will have clauses that dictate the way they operate. For example, a filmmaker may ask for an automatic extension, if they are able to raise a certain amount of money in a set period of time. If the film is not in a position to be made within the agreed period of time (normally due to lack of funds), the option lapses. The rights revert back to the author, and the author gets to keep any option money. Most options lapse before the film is created. Being offered an option on your book is the start of the process, and its something to celebrate; however, it is no guarantee that your book will make it to the screen. The single biggest factor of whether your book gets made into a film is money. All films need a budget. This is a cash amount that covers all aspects of the filmmaking process. This is not just the obvious stuff, like paying actors, cameraman, and screenwriters, but also such elements as catering, location costs, and general admin. When the filmmaker approaches you for an option on your book, they will work out just how much money they need to make the film. In the vast majority of cases, the filmmaker will not have this money and will have to raise it. We’ll first look at the traditional way money is raised, and the impact this has on the filmmaking process, before examining a newer option that is changing the ways in which films are funded. In fact, this second option might mean that your book is more likely to be made into a film. The two most important elements to remember when considering the way films are funded are that (1) budgets tend to be large, and (2) many films either make no money or even lose money at the box office. This means that, when seeking funding, the funding parties have all the power. They are looking to minimize their risk and increase their upside. They know they may lose cash, but, if they back a box-office winner, the rewards are huge. Filmmakers tend to approach organizations that have experience in backing films. These organizations vary from rich individuals to groups of investors to companies set up with the sole purpose of funding films. It is very unlikely that a filmmaker will be able to secure enough cash from a single investor, and so most filmmakers are, therefore, looking for a pool of investors. These investors will all be looking for the best deal possible. That means they will be looking to invest the minimum amount of money for the maximum return (percentage of the profit). This cocktail produces pressure on filmmakers to hit deadlines and produce films on budget. This same pressure has filmmakers making decisions that don’t seem sensible from the outside. Did you ever wonder why the director of the Fantastic Four film was trying to distance himself from the movie before it was even released? The reason was that production choices had been based on profit, not quality. In recent years we’ve seen a new way to fund films, and this is via crowdfunding. A new generation of filmmakers is emerging, and, in the process, they are looking for new ways to fund projects that leave them with more control. BubbleCow co-founder, Caroline Smailes, was approached in 2014 by YouTuber and filmmaker Luke Cutforth (known as LukeIsNotSexy to anyone less than about twenty-years-old). Luke wanted to make Caroline’s best-selling novel The Drowning of Arthur Braxton into a film. It was not the first time a filmmaker had tried to convert the book to film, with the previous attempt stalling after funding froze up. Luke’s approach was refreshing. He’d already introduced my book to his fan base, and they’d really embraced my work. I was excited to see if we could make a film from the ground up with the fans being involved from the very start. The Kickstarter process is an exciting development for both authors and filmmakers. It means that films can be funded without the negative influence of backers who are simply looking for a profit. It means the creative control remains with the filmmaker, and choices made on set can be for the good of the film, not the good of the investor. I wanted to fund the film in a way that gave me maximum creative control. I didn’t want to be in a situation where I had to cut a scene because it was too expensive or hire a certain actor because it was ‘good for marketing’. I also felt that my fans would enjoy the chance of being part of the journey and feeling part of something this big. Luke set the budget for the film at about $100,000 USD (£65,000). A small budget but enough to make the film. One of the advantages of Kickstarter is there’s no limit to the amount that can be raised. If a project fails to hit the target, then it remains unfunded, and no money is taken from backers. However, if the film hits its target, backers are still free to invest in the project far beyond its initial target. The exciting thing is that it really works. Luke announced the Kickstarter campaign via his YouTube video late one Friday night, and, within a couple hours, he’d already raised almost half of the proposed budget. Funding slowed a little in the following days, but it was not long before the campaign was fully funded. If a filmmaker is able to fulfill the criteria for the option (this usually means raising enough money), then the author is presented with a contract. This is the legal document that decides how much cash the author will get when the film is made. Before we look at the details of the contract, it is worth saying that, if you get to this point, then you need to do your happy dance. Many, many authors have their books “optioned” and never see a contract. Authors will even have their books optioned multiple times only to see each deal fall through, usually due to a lack of funding. Not every filmmaker has the financial clout of a Spielberg, and the ability (or inability) to raise funding is often the deciding factor as to whether a film gets made. Film contracts are complex beasts, and each will vary from film-to-film and book-to-book. This said, there are a number of elements that remain the same. The most important of these is what percentage of the initial budget will be set aside for the author. In essence, the overall budget is the magic amount of money needed to make a film. Budgets range from thousands to millions of dollars. The contract will clearly state what percentage of this final budget will be due to the author. Once again, this varies greatly. However, it is not uncommon for an author to get 5 to 10% of the final budget. The next element to consider will be the cut of the profit that is due to the author. You see, the author is due both a cut in the budget AND any profit the film may make in the long run. Once again this figure will vary greatly but is likely to be in the single-digit percent range, if at all. One thing to remember is that, on paper, many seemingly successful films never really make any profit. This is just the nature in which films are made and funded. Take the Star Wars film Return of The Jedi. It is common knowledge that “on paper” the film never made any profit. This is also the case for Lord of the Rings and Harry Potter, which both lost money, and Forrest Gump, which broke even. This brings us to our final point about contracts and something authors need to watch carefully, and that’s who gets the merchandising rights. Merchandising is big business, and that’s why films like Lord of the Rings, Harry Potter and Star Wars can lose money at the box office but still make money in the long run (we used to be able to add DVD sales to this equation, but that’s no longer the case, though live streaming services, such as Netflix, will have an increasingly important role in the equation). It is essential that, as the author, you think carefully about where the merchandising rights will end up going. Be aware that a cut of merchandising profits may earn you money years after the film has been made. It is a commonly held belief with authors that they should have some say in the final screenplay. As with all aspects of filmmaking, this will vary from film-to-film. It may be that you are able to negotiate some kind of creative control over the final script, but this is not always the case. Screenwriting is big business with screenwriters being able to demand hundreds of thousands of dollars for a single screenplay. It is very unlikely that you, as the author of the book, will be asked to write the screenplay. A director will want a trusted “professional” to write the screenplay and may not be happy with interference from the original author. You may well find yourself in a situation in which your story is significantly altered, and you have no control over these changes. It is not uncommon for characters to be cut from the original book (those actors are expensive). This means that new scenes need to be written and old scenes cut to ensure that key elements of the story can be delivered. You may also find that budget restrictions or technical considerations also mean that certain scenes are cut, moved or changed. The reality of filmmaking is that, in most situations, the best an author can hope for is an agreement to have some input regarding potential changes. What Can Authors Do to Make Their Books More Attractive to Filmmakers? Having looked at the initial process in which a novel is turned into a film, we now turn our attention to the things that you, the author, can do to make your book as attractive as possible to a potential filmmaker. We are going to consider three key aspects that you can control, but, before we do, let’s just dwell on one important part. These tips are all about making your book as attractive as possible; however, the key element is the story. If your book’s story is weak, then nothing else matters. These tips are about putting your story in the most attractive light possible. As the old saying goes: you can’t polish a turd. The structure of your novel. The setting of your story. There remains a belief in the writing community that writing a novel around a set structure will, somehow, inhibit the creative talents of the author. 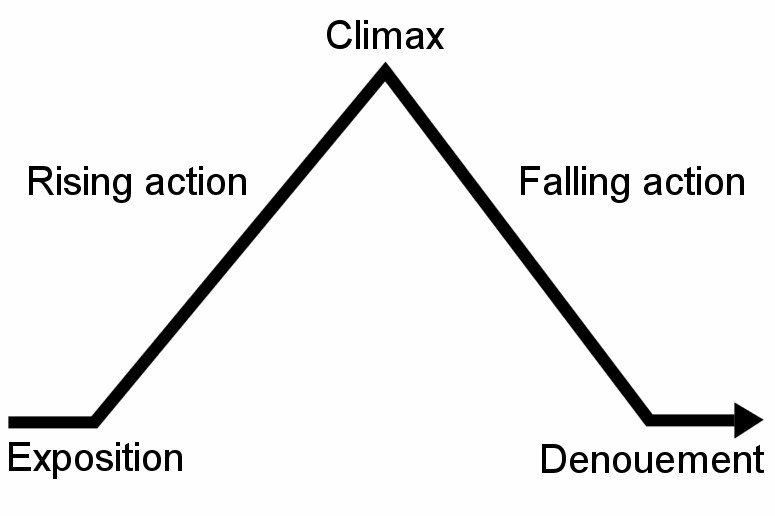 Almost all great novels (and films) are built around a three or five-act structure. In fact, one of the main jobs of the screenwriter will often be to convert the novel into a three-act narrative arc. So what is a three-act structure? In its most basic form, a three-act structure is presenting the story with a beginning, a middle and an end. The story starts with an incident that forces the main characters to act; the action then raises to a point of climax before declining to the point of resolution. This is summed up using the diagram below, known as Freytag’s Pyramid. This is a super simplified version of the three or five acts, and you can find out more here. The point is that filmmakers will almost certainly be looking to use this structure for the final screenplay. If you are able to give this to them from the start, then you are already one step ahead. Many authors fear that using a rigid structure will constrain their story, but there’s a way to get around this problem (if it is even a problem). The first step is to get your basic idea down on paper. At this stage, you will probably have very little of the story, perhaps a few ideas and characters. All that matters is that you are writing out ideas and committing them to paper. You are looking to give your story some very basic form. The second step is to plot out your story with no structure in mind at all. Every author approaches this stage in a different way. One example might be to start with a certain scene or problem and work forward (or backward) from this point. It really doesn’t matter how you do this. All that matters is that you have a very basic idea of how you want the story to unfold. The final step is to force the three or five-act structure onto your story. The key is to mold your story in such a way that the structure will produce a natural beginning, middle, and end. It will also have the added bonus of giving you a natural narrative tension, as the reader is posed with plot questions that are left unanswered until the final act. When I started writing the novel, I knew that structure was going to play an important part in the book, but I didn’t really worry about it until after the first draft had been written. I just started with the idea that I wanted to write a modern fairy tale. I had a few scenes in my mind before I even started writing. At the first-draft stage I often jump around in the story, writing scenes that interest me and developing the character’s storyline. This is, perhaps, the most exciting stage of writing. Once the first draft was complete, I went back to the story and started to convert it into a three-act structure. It’s funny how, Arthur, who turned out to be the main character, was not even in the first draft. He didn’t spring to life until I realized I needed a wider story to tie all the characters together in a structure that would excite the readers. Though it is not essential that a novel is already in a structure that lends itself to making a film, it makes life a lot easier. You will often find that one of the biggest shocks to writers is when they see that the screenplay has significant differences from the novel. This is often unavoidable but the changes can be minimised if the novel starts off structured in a way that makes sense to the director. One of the obvious differences between a novel and a film is the importance of visuals. Since a novel happens inside the reader’s mind, the visuals available to the author are unlimited. If an author wants an alien planet with an insectoid overlord, fine. Just write up a decent description. However, for a filmmaker, realizing this vision might be possible but will almost certainly be expensive. This means that certain novels are more attractive to filmmakers for the simple reason that the visuals presented are easier (and more likely cheaper) to recreate. When I started writing the novel, I had three locations in mind. The first was a lighthouse, and the second was a “holy well,” both located in North Wales. These were close to my home, and I visited them on numerous occasions during the writing process. The third location was the Victorian baths in Manchester. I visited them early in the writing process and took loads of pictures. These were pinned to the walls around my desk and were used as constant references during the writing process. This video shows the reaction of Luke Cutforth, the director of The Drowning of Arthur Braxton, when seeing the baths for the first time. In it, he explains why the location was ‘perfect’, how physical location is linked closely with the screenwriting process and talks briefly about the realities of the budget. One element that authors often don’t consider when writing a story is the number of characters involved. This seemingly unimportant element of the novel is often critical for a filmmaker. The thinking is pretty simple: actors are expensive, and the more characters you have, the more actors you need. This means that, if a filmmaker is faced with a novel packed full of characters, the filmmaker has two choices. The first is to increase the budget; the second is to decrease the number of characters, reworking the story. You will often find that a screenwriter will cut characters from a novel and reallocate their key storytelling elements to another existing character. The result is that the plot quickly moves away from that seen in the book to become something new. In the book, I added two characters called Kaster and Pollock. They were added in at about draft five or six and were actually based on the Muppet characters Statler and Waldorf. I really enjoyed writing them into the story, and felt they added a nice depth and texture to the novel. However, once the screenwriting process began, these characters were the first to be cut from the script. Luke felt that we could tell the story without them in the film version, and, to be honest, he was right. In the recent past, it was a rare event for an author to find his or her book being made into a film. Even if the author managed to secure an option, it was still an uphill struggle to actually get the film made. A new generation of young filmmakers, linked with new and exciting methods of raising funds, is allowing us to enter a golden age for films. In the coming years, we will see filmmakers becoming more experienced at raising funds, along with viewers and readers becoming more willing to back exciting new projects at the grassroots level. As an author, you can play your part in accelerating this process. By writing with a clear structure, being mindful of settings and considerate with the use of characters, you can produce a novel that’s attractive to a potential filmmaker. Filmmakers will always be looking to adapt novels, and there’s no reason why you can’t capitalize on this process. By understanding the filmmaking process and writing your book with one eye on the chance of an adaptation, there are more chances than ever that you’ll see your work on the big screen.